I’m super glad we got the grant for our project! Yay! While reviewing the video that Lee posted summarizing our project, one statement stuck with me—but in a good way! Lee expressed, “So, Tiffany goes overboard sometimes…” (She did finish, “but this is great!”). At first, I thought, “Oh shoot. I do don’t I?” But then immediately I thought, “Yeah! I sure did! Because I CAN!” Had I been doing a project like writing, crafting, or creating a different type of product, I would have been greatly limited by resources, time and stamina. 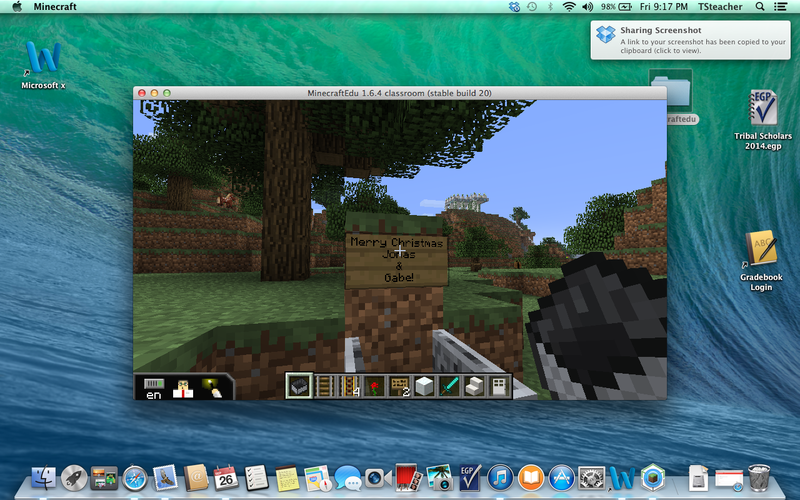 But by using a vehicle like Minecraft, I was able to just keep going. But I’ve also done that with other projects and gotten far less compelling results. 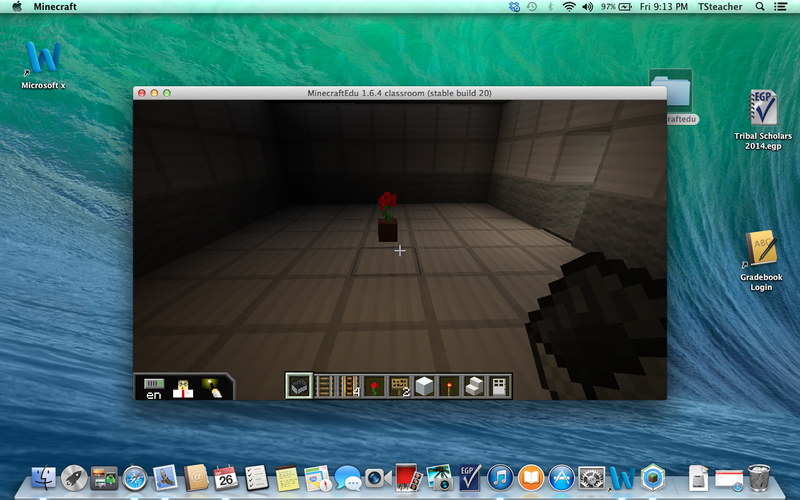 It does help that I’m pretty familiar with Minecraft, so it does help with carrying out what’s in my head. But I also like the ability to work with my teammate pretty freely. Amanda built a great library, and it was fun to work together on our garden. And then, after we completed our product, others could actually visit our work. I was able to ride my horse over and check out the German Governmentalists’ institutions. They were very colorful, and very creepy when you’re aware of their intent. But it was great! It was also fun to have the onsite competition and “trash talking”. Lori cheering on her genetically-modified pigmen and Thomas trying to convince Amanda and I that we needed new men in our lives. So I really enjoyed the challenge this week. It was a great experience and I’m looking forward to presenting a similar experience for some students! Post-WWI Germany in Minecraft? YES! This week were challenged to take on the role of two different factions within the setting of post World War I. It was the German Governmentalists versus the Women’s Advocates. The Governmentalists were promoting women to re-marry and immediately begin breeding Aryan babies. The Women’s Advocates were focused more on women becoming independent; and empowered to work for the good of their country. I will admit, at the beginning of this challenge, it did seem a little daunting. We were given a goal, but not specific instructions in how to accomplish that. But once I got past the initial scare, I realized that the openness was actually a gift. By using the guideline… I could do anything! By putting myself within a role to play, it was a really fun experience. What would I do if I were a woman striving for self-sufficiency? I was having fun building a whole back-story. While grieving for my dead, war hero husband, Volfgang, my character decided to move on with her life. By first developing the iron mine that has been in her family for years, she took those resources and helped build a haven for ALL looking to work—women, men, and families. All was for the greater good and rebuilding a distraught nation… like my character. With my fellow widow, Amanda, we built the “Always Strong” village—complete with university, barracks, produce garden, horses to train, cows to butcher and milk, pigs for butchering, chickens to raise, sheep to sheer, lumber to chop, and a mine shaft. That looks like a pretty self-sufficient village to me! I found myself REALLY wanting to play this village on survival mode, because we would have been amazing! If I were to come away from this experience, and write a paper about the struggle of women during this time in history, I could probably produce something incredible. My perspective would be much more inclusive than compared to if I were just to read the text and write. 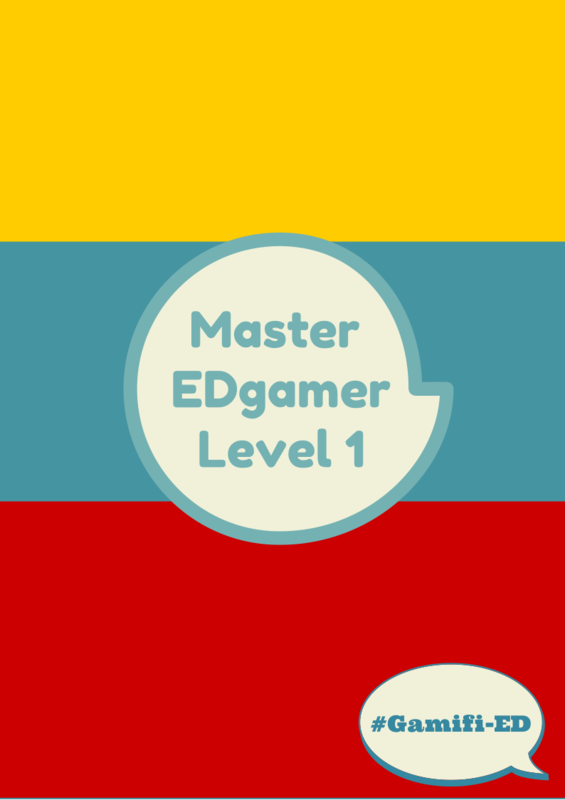 It’s one thing to theorize how gamification works, but to actually experience it was really neat. Not to mention, a lot more fun! I used this video in my portfolio over the summer, and I’m finding that the “Baby Boomer” perspective isn’t just limited to an age group. What I’m learning a lot from this week, mostly in my local setting, is that perspective influences so much– especially in how we respond to people. I’m finding that just because I don’t understand something, it’s not stupid. For example, I’m not much of a Pokemon fan, but a lot of my students are. When they ramble on about the various categories of Pokemon, I am completely lost. However, I still listen, because it’s something they’ve dedicated time to. Was it a waste of their time? From the perspective of possible employability– probably. However, I can respect that they’ve developed a specialist language in order to more easily communicate. Can I take that interest and turn that into learning– absolutely! Tons of literacy I can use there! I don’t necessarily consider myself the most creative of educators, but I do try to keep a good perspective and grab a learning opportunity when it presents itself. I’ve also found how incredibly anti-social something so readily acceptable like reading can be. I know. Believe me, it hurst to say it. Especially since I’m a Reading Specialist. But as I’ve been catching up on reading, I realize I’m spending hours not talking to anyone, and that’s difficult with toddlers. When I’m reading a common book with people, we have TONS to talk about… after we’ve read. However, when my husband is sitting in the living room gaming, I can see right there exactly what he’s doing. We discuss it. We strategize together. We look up wiki’s when we get lost. We problem solve together. This isn’t saying there’s a wrongness to reading. Of course not! I am inviting and examining of what’s considered “Acceptable” learning practices and why. Sadly, I missed the group Minecrafting time this week. I had the grand opportunity of taking my class to The Maze Runner, since we just finished the book. It was a disappointing (movie), yet incredible (students) experience! I did, however, catch up on my own some. I miss crafting with people. Thank you again, Mia, for getting me the correct password! It would have been a VERY long haul to walk/swim everywhere and mine all the materials needed myself! 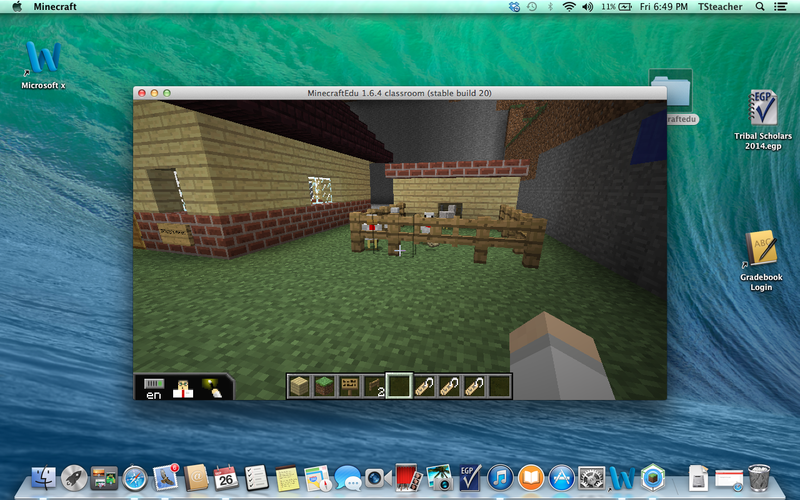 And my Chickens with coop on the side of the ranch house. I got it stuck in my brain that I just wanted to do a walk through experience of the highlights of The Giver. If you read it, then you would know EXACTLY what each (kind of artsy) element represented. Welcome to The Community. Just walk through the door. Follow the rules. After Jonas becomes a 12, he gets a new set of rules. Not quite an apple, but it’s significant. The Giver’s home– rich in colors, warmth, and love. Merry Christmas and a building in the distance. 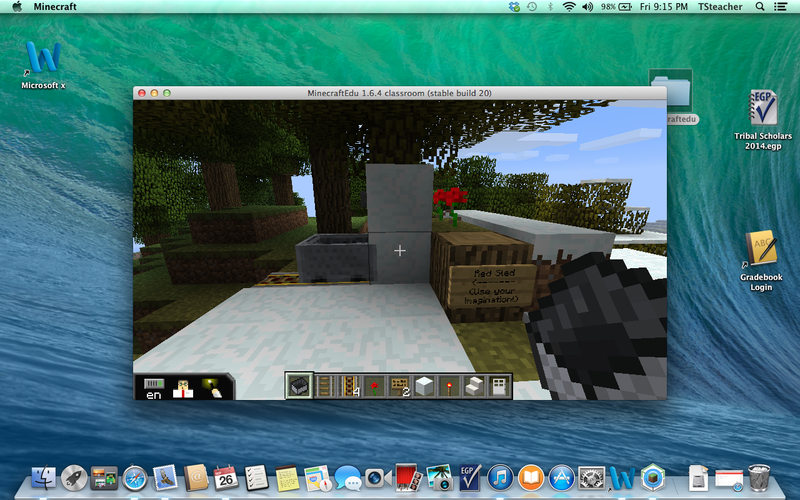 What tools can we use both in and out of Minecraft, to create a convincing case that learning occurred? As much as I just want to play and have a grand ‘ol time with my students, in the back of my mind I know I need to justify what I’m doing with them and demonstrate that learning is taking place– especially since I am working in a grant-funded program! Assessment is essential for showing progress and modifying learning. But it doesn’t always have to be so painful. Speaking specifically, Minecraft lends itself to the following gamification elements: storytelling; experiencing the concept; role playing; experiencing consequences; and replayability. That’s a pretty impressive resource! However, I need to be able to demonstrate that certain elements of learning that align with standards have occurred. I utilize these same concepts outside of the gaming world as well. While we were reading The Maze Runner, I would have some of my students recap the previous night’s reading by acting out the dramatic scenes with paper dolls (it was pretty great, by the way). That’s a mild form of role-playing, but it still engaged the students. And the discussions that we have held over the topic have been amazing and insightful! And pardon me while I digress and gush a bit about my students—I’m just so proud of them! My students are all Alaskan Native, and they were invited to attend the program that I teach because a majority of them were having difficulty in public school. These were the kids who were written off. I was told by a number of people outside the program, but who knew about it, that this would be a tough job. That these kids just didn’t want to work. That the only thing I could hope for them was to painfully bring them up to a “D” average and hopefully keep them from dropping out of school. When I listen to these students “chomp at the bit” to excitedly tell me their thoughts on passage of reading; excited to share their written works with me; and excited to begin a project at school, it just makes my heart all gushy. These kids are kicking those terrible expectations right in the face, and I love them for it! So I guess that’s part of why I fight so hard for gamification—this is their world. They get it. And sometimes, just because I may not completely understand, or “get,” what they’re into; but I will respect it. Just because I don’t understand it, that doesn’t mean that it’s stupid or anything less than what I think is important. You don’t even have to tell me twice to try and justify using videogames for education! I feel like this is where I have lived for the past 10 years! I realize, for some, and video games are a harsh reality. It’s difficult to see the usefulness. Tough to justify the cost. And kids just aren’t getting outside anymore! But one thing you cannot deny is that for children, video games are engaging! As a parent, I can appreciate the difficulty in getting a child off of their games to go do something else. But I also see the value that is there to offer. I keep harping on this, but my brothers and I grew up with video games. We’re all fully functioning adults that are successful in our chosen careers. And taking it apart and analyzing it I realize that my mother did a lot of the right things in monitoring our game play. She allowed us to be engaged in what we were doing, but set time limits (sure, we’d mess with the timer when she’d set it, but she wasn’t a dummy). She was aware of what we were playing. We knew NEVER to try and bring a game like “Mortal Kombat” into the house. She never sat down and played with us, but she did let us tell her about the all the things in our games that made us excited—and she never squashed that excitement. Of course, video games will never replace real life. It can, however, spark interests for students who might not otherwise be exposed to such interests. For example, I live on an island in Southeast Alaska. We don’t have cows, functioning farms, or other agricultural elements. However, should one of my students begin playing Farmville; or other games that emphasize farming, they might just want to try their hand at such an endeavor. That’s sparking a curiosity and interest; and that’s where real learning comes from. I tend to utilize gaming with my students for reading practice. Regardless of what the students are playing, I tell them to turn the subtitles on. This helps with practicing speed-reading and understanding voicing. They’re going to be playing anyway—I might as well make it productive. My high school students also appreciate that they can connect with me on a common level. Sure, I’m their teacher; but I also don’t mind taking a moment to shoot the breeze and discuss the finer points of Final Fantasy 7. I ask them for tips on Minecraft. We discuss the new games coming out and debate about what is the better system. We’re building rapport, because I am respecting their interests and sharing in them. 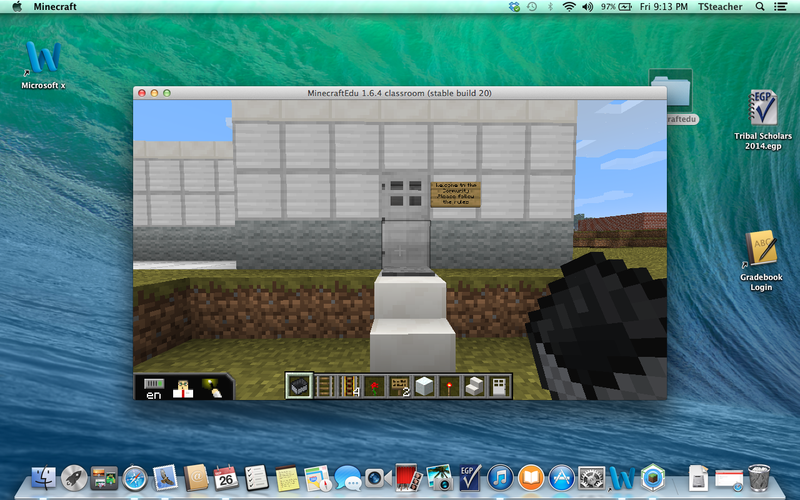 How can we use Minecraft to create a sound and robust learning experience for students? 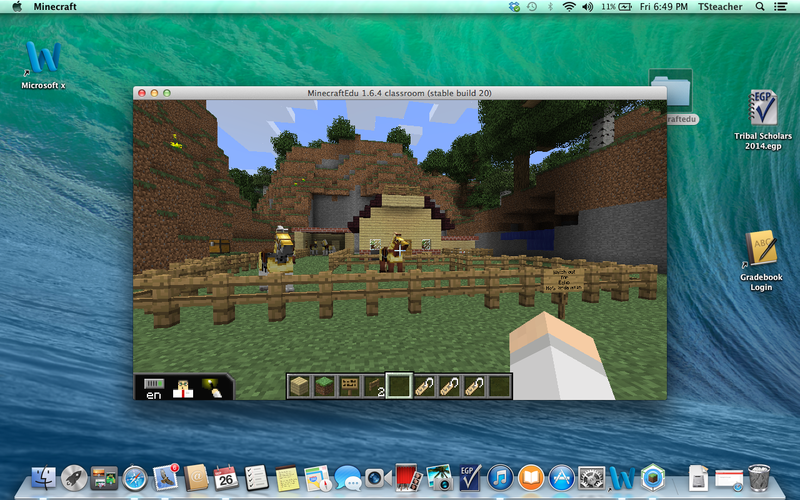 Sandbox games like Minecraft are incredible in their ability to allow the gamer to simply create. Quite easily, a teacher can now offer a virtual environment for the student to experience something that they couldn’t do in real life. For example, my students are currently studying The Maze Runner. It is highly inappropriate for me to put them into a giant maze with killer beasts and ask them to solve the maze. 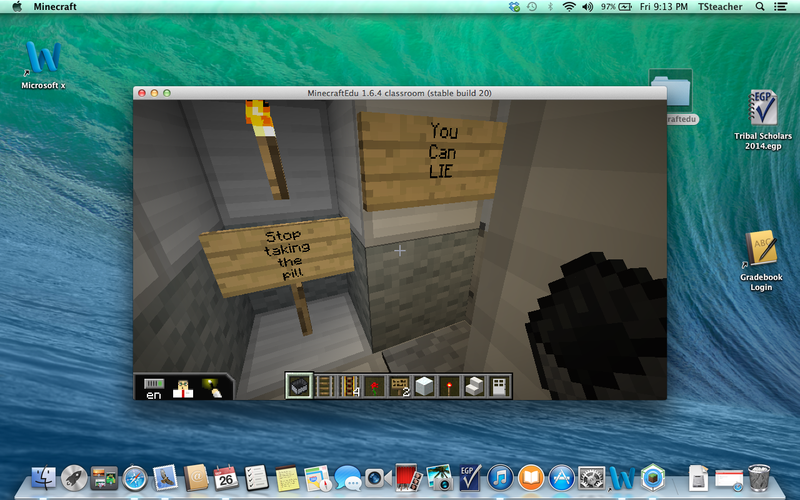 However, in Minecraft, I can do that, and the students will love me for it! Remember those projects when we were asked to build dioramas? Sure they were fun for the moment. But then you’re left with a bulky box that inevitably sits on a shelf for a long while, and collects dust until you pull it down one day and wonder why the heck you even hung onto this. 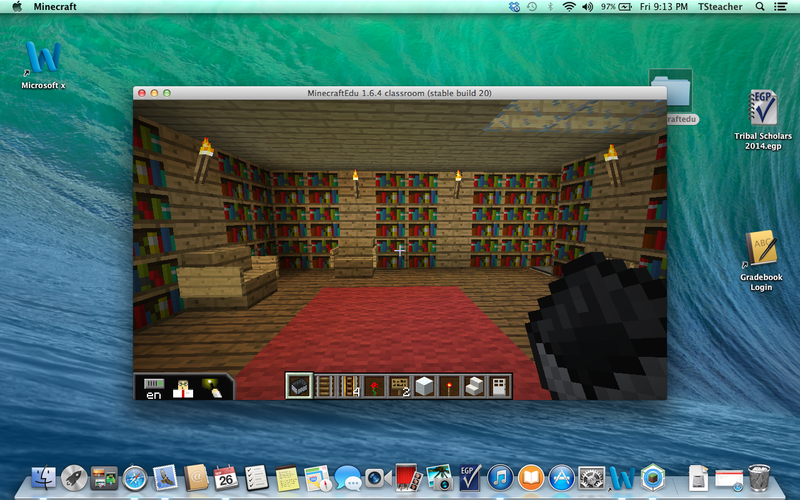 By utilizing a game such as Minecraft, students can create an entire world, paying attention to specific details, and then take their teachers and peers through a tour IN the world they just created. That’s cool! Playing video games also frees you to be someone you wouldn’t normally be. I’ve barely ridden a horse only a couple of times in my life, and it scared the daylights out of me! They’re so tall! But in Minecraft, any opportunity I have to ride my glorious steed, I will take it! Same with Legend of Zelda, and Skyrim. I can read a Kingdom Hearts comic and see/read what Sora, Donald, and Goofy are up to. But when I play Kingdom Hearts, I AM Sora, travelling with Donald and Goofy and trying to save the Disney universe. The gamer can also make decisions free of real life consequences, but still experience the consequences within the game. If I choose to go install pretty pink carpet in Thomas’ cloud house it might be funny at the time. However, I had better be prepared for him to come to my mansion and install and entire flock of chickens underneath my floor. Right there: Influencing pro-social behavior and problem solving. It’s incredible! They’ve obviously been doing this for a while, and people are sharing their resources. Lesson plans for science, math, language arts, social studies, and humanities. Awesome! Anytime I don’t have to reinvent the wheel I am totally for it! Bethsada Softworks. (2011). The elder scrolls v: skyrim. [Playstation 3]. Rockville, Maryland: Bethsada Game Studios.